Better management capabilities, improved relationships with managers and better relations with direct reports are the three biggest improvements that executives and managers realized from individual executive coaching programs they received from OI Global Partners, a leading human resources consulting firm. The most popular goals of the coaching programs were: better leadership skills, improved communications skills, better management skills and improved interpersonal skills. Almost half of the coaching candidates reported that their goals were very effectively achieved and about one-quarter reported their goals were extremely effectively achieved. Trust is the number one quality that executive coaching candidates desire in a coach, followed by experience, integrity and personal chemistry with the coach. It was found that the ability to create a trusted advisor relationship was key to success in the coaching relationship. More than half of the coaching candidates were extremely satisfied with their coaches, while 4 in 10 were very satisfied. The survey covered 50 executives and managers who received individual executive coaching programs from OI Global Partners firms. “Organizations most want the coaching programs that their executives and managers receive to build their leadership skills, followed by improvements in their communications, management and interpersonal skills. Being able to communicate, manage and get along with people better are critical components of leadership,” said Patty Prosser, chair of OI Global Partners. 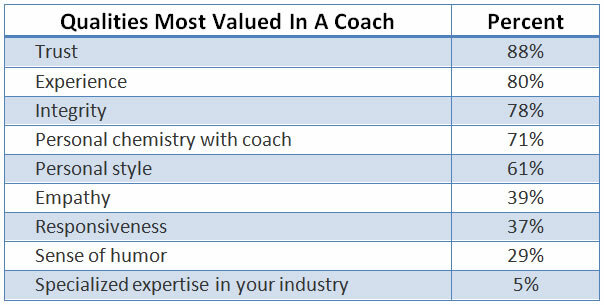 “It’s no surprise that trust is the number one quality that executives and managers most desire in an executive coach. Coaches help them improve their leadership, management, interpersonal relations, employee motivation and engagement skills and work on areas that need to be developed further. Executives and managers want coaches they can trust to make the best assessment of their abilities and to keep their guidance confidential,” said Prosser. “Three times as many executives and managers feel that trust is a more important quality in an executive coach than having a sense of humor. However, the coach’s experience, integrity, and their personal chemistry “fit” are qualities that are valued almost as much as trust,” Prosser added. The top individual improvements that coaching candidates received were: better management capabilities (69%), better relationships with managers (63%), improved relations with direct reports (59%), better relationships with colleagues (56%), higher engagement in their jobs (41%), better motivational skills (37%), better teamwork (37%), advancement in their careers (32%) and greater job satisfaction (32%). The top goals of the coaching programs were: better leadership skills (68%), improved communications skills (61%), better management skills (54%), improved interpersonal skills (54%), better motivational and employee engagement skills (44%), and increased likelihood of being promoted internally (37%). The most desired qualities in an executive coach were: trust (88%), experience (80%), integrity (78%), personal chemistry with coach (71%), personal style (61%), empathy (39%), responsiveness (37%), and sense of humor (29%). 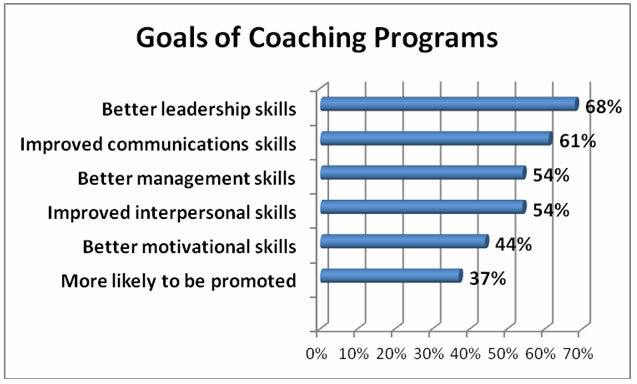 How well coaching goals were achieved were: very effectively (49%), effectively (27%), extremely effectively (24%). Satisfaction with executive coach was: extremely satisfied (52%), very satisfied (41%), and satisfied (7%).